Match the pictures with the body part name. It is a memory game about feelings. 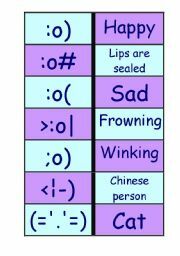 It can be used as a flash card to present to students the topic feelings and emotions. Enjoy it! This song can be useful to work with past tense with our students. 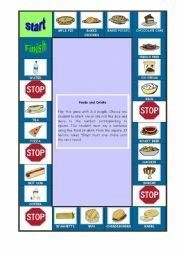 Foods and Drinks Play this game with 2-4 people. Choose one student to start. He or she rolls the dice and moves to the number corresponding to square. The student must say a sentence using the food or drink from the square. If he/she takes �Stop� must stay there until the next round. 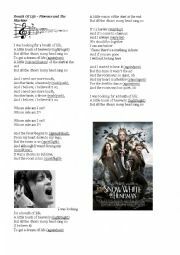 Song of the movie: Snow White and the hustman. These cards can be use with teenagers working with the topic Internet Language. Teacher can show to the students how different the language is becaming because the internet. Soon I will send the next part of the game. Just cut the cards and enjoy it! 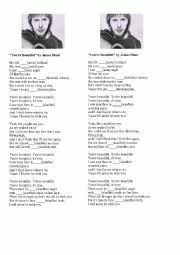 A song to complete the articles and the to be verb. This activity was elaborated by me and some collegues from the graduation course. It was based on the movie Sweet home Alabama. There are some reading and writing practice. This power point was elaborated by me and my friend. There are some considerations about writing expository texts. 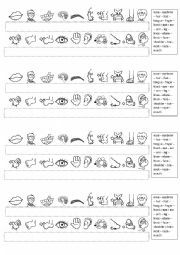 Read it and try to apply in you own writing activity. I hope to help you. 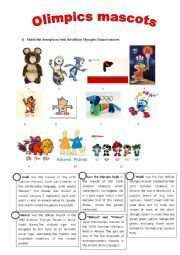 This is a retrospective about the official Olympic mascots. Good to work with students of high school. This presentation is about the principles of the communicative language teaching. This presentation was elaborated by me and my friends. 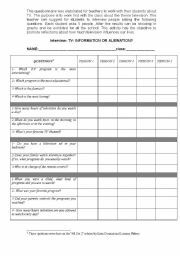 We suggest some ways to work with writing skills based on the teory by Barbara Kroll.